I have two--count 'em--two shows opening next week, one in Portland OR and another across the river in Vancouver WA. The shows highlight two quite different bodies of work. The Cascade Sotheby's exhibit opens for First Thursday, June 2nd in Portland's Pearl District, featuring my "Frozen Ponds/Arcadian Forests" series of semi-abstract paintings. Opening on First Friday, June 3rd at Boomerang in downtown Vancouver will be a group of realist paintings done over the years of my dear dogs Pablo and Winslow. 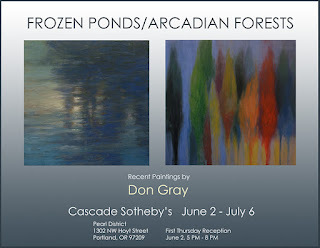 If you're near, hope to see you at one or both receptions, but if you can't make it then, don't worry--both shows will be up through the month of June. 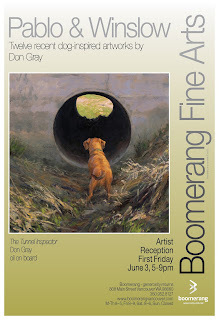 I hope you enjoyed your openings Don. You've been busy & we've missed you! Do you no longer email your blog posts? If so, I'm no longer on your list - found your link on someone else's site. Hi Marilyn--thanks for the note--good to hear from you. I've had a kind of "perfect storm" of server issues related to the blog. (Most of my posts are on another server, not on blogger, and they've up and disappeared.) That, combined with other technical issues has kind of toasted my blog and email sends. So I'm not blogging much anymore--have pretty much moved to Facebook for posting. I need to check in with old friends more often, though. Hope you're well and busy making art. Congratulations! They both look like wonderful shows.